SAWASDEE BI MAI! 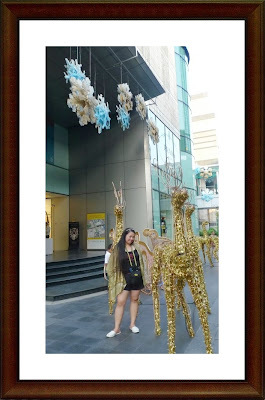 My Brother and I celebrated New Year 2010 in Bangkok, Thailand. And I LOVE it there~! Meet Dollar a huge work of art in Thailand. "Dollar 009" an installation that abruptly sits on the chaotic pavement outside and announces the BACC's arrival in a chaotic and crowd area. She, for this work is clearly a "she", has been quickly taken into the hearts of the citizens of Bangkok and is already an attraction in her own right with a constant stream of passers-by snapping her on cell phones as they pour along the elevated walkway to the MBK centre and the National Stadium BTS station alongside, and all the time she looks at the teeming masses, aware of them, but ever lost in her own thoughts. 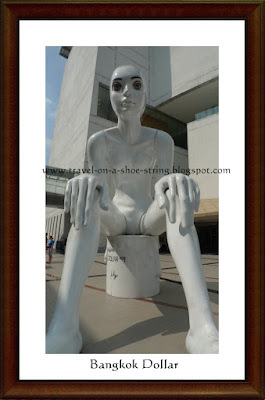 Dollar, made out of fibreglass and finished in a lustrous white, stands out, a calm figure in a clamouring sea of people and traffic zig-zagging one of the busiest junctions in a busy city. 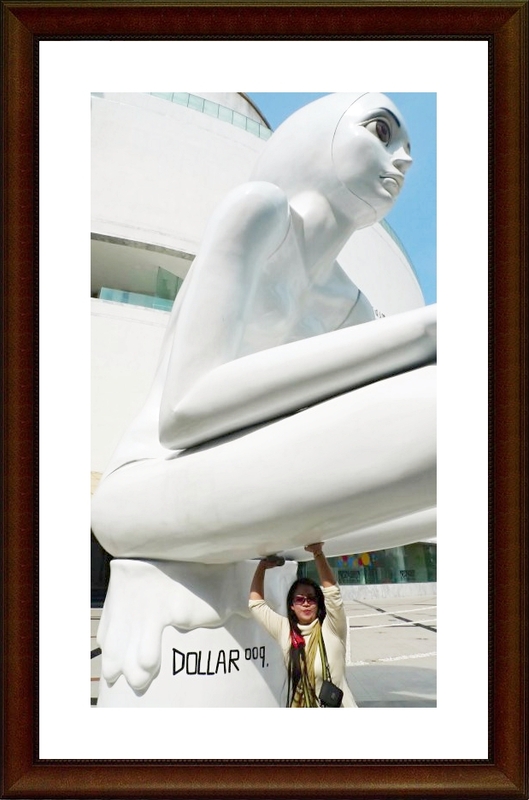 It's an edgy stature though, the artists idea, Dollar-009 isn't comfortable, she's perched too close to the road and looks uncomfortable, and it means it's impossible not to be taken with her and she tugs at your heart strings. You connect with those huge eyes, but you feel awkward, something isn't right. The artist intended to make dollar look tense (stressed, not relaxed) and not lively to contrast with the environment around her during the day and to resemble loneliness in the night time. The name is drawn from the currency of the United States and the influence that country has on the whole world. Shopping is really really cheap I bought a shirt for 35 baht that is more or less P 49.00 Please take note that it is made in Thailand, so the quality is good. My brother had a blast @ Central because he got his Mark & Spencer shirts at 70% off! wow new template ang blog. nice nice! thanks Chyng nag experiment ako kahit wala nag tuturo sa akin ha ha ha! thank you very much traveller! Oo nga po Romelo, talagang Thai na Thai dating ni Ronald doon sa Thailand ha ha ha! 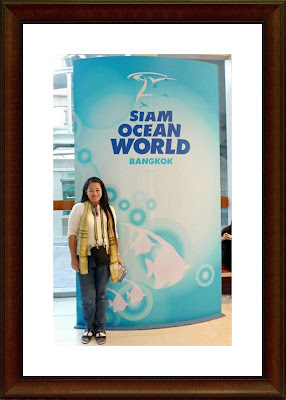 My post is all about a province outside Bangkok. Hope you can check it out. You might want to come and visit someday. I agree! most fabrics that are Thailand made are of good quality. Looks like you've had a great time doing your photo shoot in Thailand. I want to visit Thailand soon.. hehe hope to travel with you in the future.. Take care, Cha! one of the fave places in Asia that I will visit soon. thanks for the photos. Ayos si Ronald Mcdonal ha! Sabay sa Kultura ng mga Thailander. I fancy to go to Thailand one day. Giant fiber glass Dollar statue caught the passers by and the tourist in entering Bangkok. Is this Bangkok's landmark for its economy? The expression of Dollar is a reflection of how the USA treated Bangkok. Is that so? What's the historical signifance of this Dollar 009? Thailand! One day, when my travel fund will get bigger. I would like to go there! 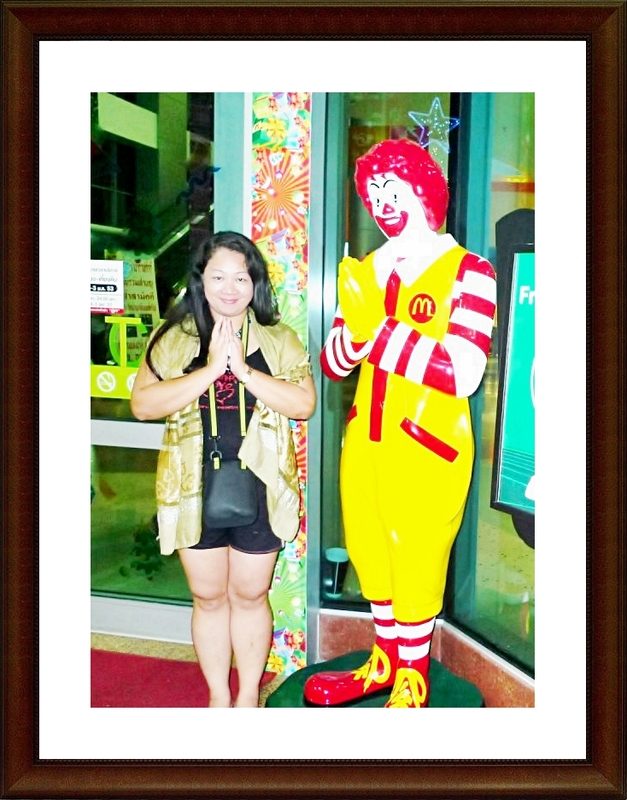 sobra akong natuwa kay ronald mcdonald ... love it! Gorgeous Thailand...nice photos and really obvious you enjoyed your holidays. Thailand is really a nice place to visit. People are accommodating and nice. Wish I'll have my chance to go there too.. well, after singapore maybe.. hehe. I agree about the McDonalds!! hhahaha! I prefer the happy bee though. I got confused with how the pictures were framed. I guess that was intentional..
Thailand is a must see travel destination. 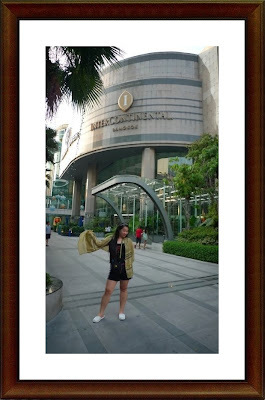 I wanna go back to Bangkok and shop, shop and shop. Super affordable! I want to see Dollar too!